1) Every single time I am called about a stray cat problem, I tell the caller that I deal only with wildlife species, not cats, and I refer the caller to the Orange County Animal Services at 407.836.3111. I have no interest in dealing with stray cats, and the grumbling that some people give me about them. I only do one or two stray cat projects per year, at the properties of high-profile clients for whom I do wildlife removal, such as that hotel and car dealership. I'd rather never deal with stray cats. 2) Every stray cat that I catch goes directly to the County Animal Services, for them to deal with. That is, I do exactly what the county would do, trap them in a cage trap and bring them to the facility. If you have a problem with what I do, then you also have a problem with the government animal services, who provide a valuable community service and are very well educated on the matter of stray animal protocol. 3) There's a big controversy amongst various cat parties about the best means of stray cat control. Many people advocate trap and spay/neuter programs. I can't spay or neuter cats, so I don't, of course. I have heard extensive arguments on both sides of the issue, people who say that spay/neuter and release is a terrible approach, and others who think it's just dandy. I have no opinion. 4) I do have one opinion that I think is important. Many people take a very myopic viewpoint when it comes to difficult topics, such as death. I've always been irked that people will gasp with horror and pity when they see a car accident on the side of the road, but somehow go through the rest of their happy life ignoring the fact that at all times, at this very moment, atrocities and suffering are happening on a grand scale worldwide. But no, people can only see the tiny thing in front of them. Similarly with stray cats, people can only see that a person who would trap and kill a call, kills a poor innocent cat. Never mind that this poor innocent cat, if left to live, will kill, in a far more brutal manner than the County Animal Services, countless birds and small mammals. Why is the life of that cat worth more than the lives of all those other critters that stray cats decimate? I don't get it. I understand that nature is brutal, and that almost EVERY living thing on this planet meets a painful and untimely demise. So it is with stray cats as well. 5) Don't feed stray cats. Yes, it's fun. Don't feed stray cats. Yes, it's a joy to see hungry stray cats eating, it makes you feel wonderful and warm inside. Don't feed stray cats. Yes, when you bring a lot of cats together, fighting and disease between the animals happen. Don't feed stray cats. Yes, when you feed any wildlife, a higher population sprouts in the area, and if/when the food source is interrupted or stops, the animals as a whole starve and suffer, and everything is worse off than it was before. Don't feed stray cats. 6) Finally, spay or neuter your pet. It's one of those important things that some lazy people will never do, and it's the cause of the problem in the first place. 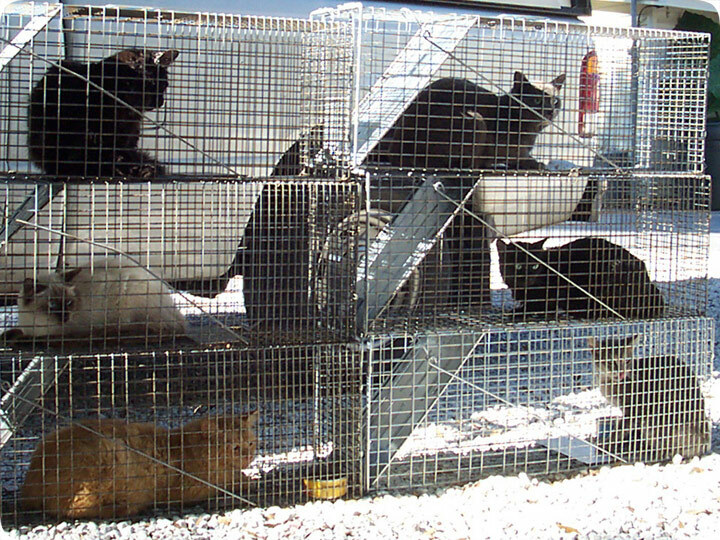 Cat trapping is easily accomplished by setting canned or dry cat food in the back of a large steel cage trap. Some cats are wary, but most go right in after the food.